Home Medical Marijuana/Cannabis Canada Finally Legalized, But A Big Question Remains: What About Edibles? Canada Finally Legalized, But A Big Question Remains: What About Edibles? With recreational legalization’s October 17 start date fourteen weeks away, Canadian LPs, craft growers, and public and private retailers are all putting in long hours to get their businesses ready. But another group is working hard as well, for a longer deadline. Across Canada, brewers are rushing to develop cannabis drinks—but not only can they not sell them, they can’t even get them legally taste-tested. Some of the biggest deals in the cannabis sector over the last year have involved beverage producers—from the Constellation Brands $190M investment in Canopy last October to the entrance of America’s largest wine and spirits distributor Southern Glazer’s into the Canadian market this past May. Even the Province of Ontario handed a $30,000 research grant to a college working with Province Brands of Canada to brew the first cannabis beer. Despite all their investments, however, there is still no clear sense of precisely when edibles—and drinkables—will become legal. Bill C-45 legalized only dried cannabis, fresh cannabis, and cannabis oil, delaying the legalization of edibles, drinkables, and vapeables for up to 12 months after October 17. Yet virtually every company and investor betting on the cannabis market expects edibles will be where the real money is. Aurora’s Cam Battley has said he expects smokeable cannabis will soon represent the minority of the cannabis market. And because of the social role that drinking already plays in most communities, many see beverages as the best way to sell cannabis to a large audience. New cannabis users repulsed by the idea of smoking anything may be won over to cannabis delivered in a drink they can enjoy slowly over time. Meanwhile, the slower consumption pace of beverages seems less likely than chocolate bars and gummies to inspire novice users like the New York Times’ Maureen Dowd to consume multiple servings of edibles in one sitting and descend into hallucinatory paranoia. Meanwhile, those who wish to microdose for pain or anxiety, or simply to relax, find it easier to rely on edibles for precise measurements. Currently, a rough third of Canadian cannabis users already say edibles are their consumption-method of choice, while nearly half of Canadians polled last year said they’d try edibles if they were legal. Taken to its logical extent, this approach would ban the majority of edibles that adult Canadians want to sample. Adults, after all, like candies and sweets too, which is why we already allow potentially lethal alcohol products in flavors more appealing to teenagers than scotch or stout. No reasonable person wishes to make intoxicating products children will mistake for regular candy or baked goods. In Colorado, the number of children accidentally consuming cannabis spiked after legalization—but there’s no reason to believe banning commercially produced edibles is the only way to avoid that happening. With regulations that will make all cannabis packaging resemble biohazard specimen bags, it seems unlikely children might mistake a cannabis chocolate bar for candy—and the recent Health Canada regulations redoubling child-protection features on packaging will make it harder for kids to get at cannabis in the first place. The multi-billion dollar cannabis industry will push hard for edibles and beverages, which means the Task Force’s proposed ban on any cannabis product resembling an already-existing food likely won’t be taken up in full. Between the austere packaging and tightly controlled retail limits preventing cannabis from sale where children can buy it, the government will likely feel they have limited children’s exposure enough to allow baked goods and sweets. A second issue for the production of edibles will be determining serving sizes. 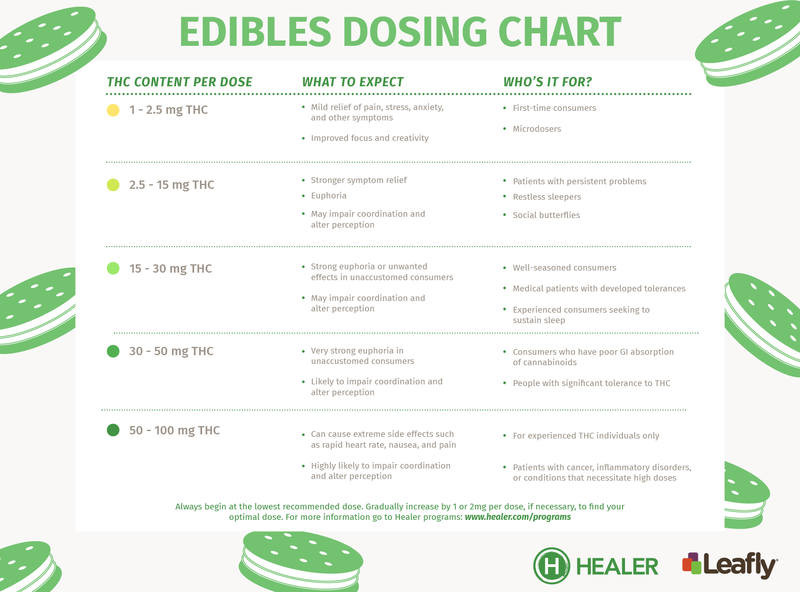 In California, edibles must appear in servings containing no more than 10mg, either per-cookie/brownie/gummy, or in edibles that break into 10mg pieces. The Canadian government is already discussing maximum THC for other products so it seems likely they will implement controls over how much THC edibles can contain as well. Breaking a cannabis chocolate bar into equal 5mg doses is a nice idea in theory, but as anyone knows who’s had two mild cannabis gummies from a package only to find the third one welded them to the sofa for the afternoon, there remains the risk of “hot spots” in edibles processing. Distributing active cannabinoids equally throughout the finished product is a difficult process. For those buying edibles from grey-market dispensaries in recent years, the more widespread problem, as the Globe and Mail reported two years ago, is edibles that don’t have anything close to the amounts of THC and CBD they claim to contain. This issue will certainly play in the favor of beverage manufacturers, since it’s far easier to disperse cannabinoids equally throughout a batch of liquid than a batch of gummies, though it may simply result in companies that inject each gummy with a regulated dose of THC. Where that will leave bakery edibles and savory edible-makers is uncertain. Expect the effects to be stronger and longer lasting than smoking. That part is comparatively simple. The real challenge in edibles regulation will be between meeting the demands of the cannabis task force for child-safe products, and in creating products that consumers can reliably consume without surprise double-dosing or underdosing.